You guys are in for a real treat today. Maybe it is all the Halloween candy I am jacked up on, but I am feeling generous and thought two recipes is always better than one. Especially when paired together they make the perfect lunch combo. I always have quiona on hand. I buy the large bag at Costco that lasts forever, so I am always looking for new quiona recipes. This one had great flavor and took no time to whip together. We served ours as a side at a cookout and it was a big hit. It would also be great for dinner with grilled chicken or shrimp served over top. As for the hummus. I am a hummus freak. I eat it everyday and most times I eat half a container in one sitting, that is how much I love it. I have made my own hummus before but never avocado hummus. The avocado with the white beans creates such a creamy, smooth, and flavorful hummus. Seriously delicious and all you do is toss all the ingredients in a food processor- easy right?? For the past week I have been eating the quiona salad and avocado hummus with pretzel crisps for my lunch. It is the perfect lunch combo!Enjoy and Happy Halloween! Cut out the stem and remove seeds from the red bell pepper and cut into very small dice (about the size of the black beans.) Slice the green onions into thin slices, dice the jalapenos and wash, dry, and chop the cilantro. When the quinoa is fairly cool, combine quinoa, black beans, diced red bell pepper, and sliced green onion in a bowl. Add enough dressing to moisten all the ingredients. (You probably won't need all the dressing, but save the extra to stir into any leftover salad that's been in the fridge.) Gently stir in the chopped cilantro and serve. This keeps very well in the fridge for several days. The salad absorbs the dressing when it's refrigerated, so it's best with a little more dressing stirred in when you're eating the leftover salad. 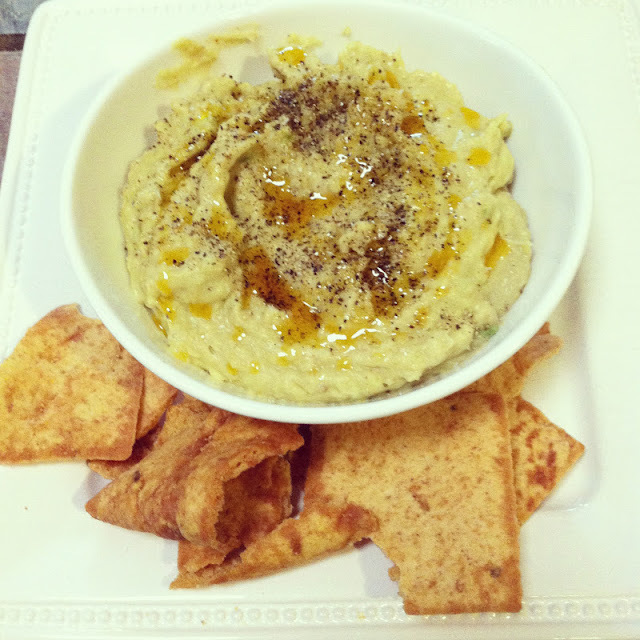 side note- I always drizzle my hummus with infused harrisa olive oil and sprinkle with salt and pepper before serving! 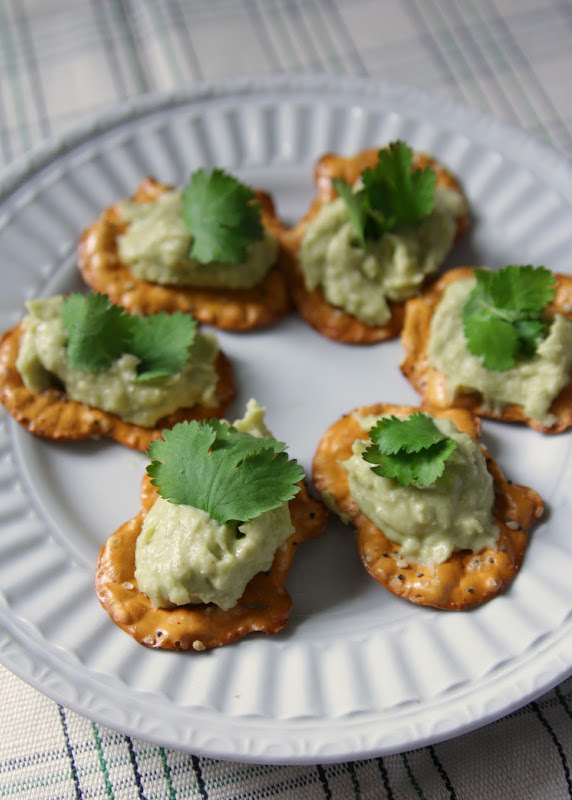 On The Lovely Cupboard blog, she had the fabulous idea to plate the hummus on Pretzel crisps with Cilantro sprigs for a party. How cute is that? Both look divine and healthy, I am on it! These sound so dang good - I've only recently started eating quinoa and while I feel like it's an acquired taste, I'm beginning to enjoy it! Definitely planning to try my hummus with pretzel crisps, that's a good idea. I think I have that pinned, looks so good. It was the avocado hummus that sold me. You always have me wanting to eat a healthy lunch. :) Both of these recipes look amazing. I love quinoa so much it's like crack to me! Thanks for these recipes. yummy! Both of these are going on my list of things to make. Avodacos and hummus? How can you go wrong? Yummm!! I love hummus too, especially the three layer hummus from TJ's!! Will definitely have to try these recipes!! Both recipes look so delicious & I'm especially excited to recreate the hummus! 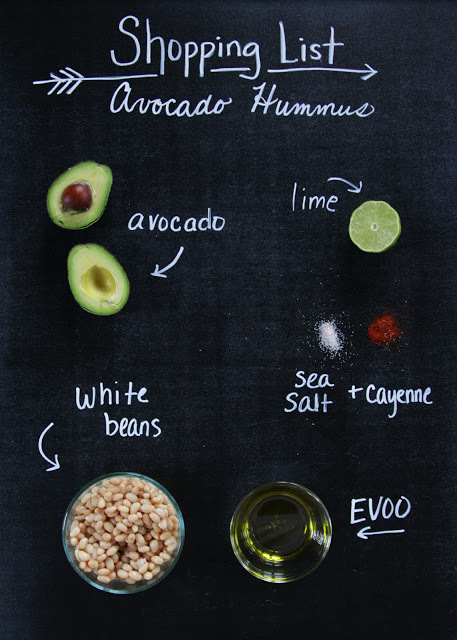 These both look so fresh and delicious, I'm super craving that avocado hummus right now! that quinoa looks incredible! love your healthy recipes! Cassie, Courtney and I were actually just mentioning the awesome things you cook up! This looks awesome. Looks delish! Will def have to make! I need to make this asap. Tell Me You Don't Love a Good Sale! Estate Sales: I'm Dishing all my Secrets.